My week was all work. 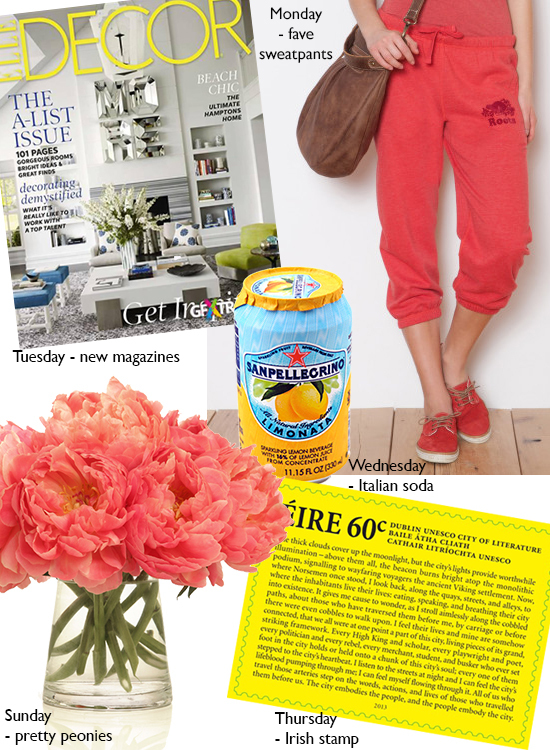 In my few spare moments, I reached for easy things; magazines and Italian soda, my new favourite sweatpants (can you believe I bought coral sweatpants? I can't) and the beautiful fade of peonies. Some more substantial things caught my eye too, but I mostly filed them away to later read. One piece I did read was Alexandra Molotkow's piece on friendship and loneliness over on Hazlitt. I fight this feeling, but I do sometimes feel that - as a single woman so far from home - loneliness is especially mine. But I also find that, for me, there's a tremendous and rarely articulated upside to brushing up against loneliness. I often feel this way about insomnia too (not so this week, when I felt I might die on the subway one morning). But I love this piece, which I tweeted a long time ago and just dug up again. I believe it too speaks from the side more often unspoken. It's a three-day weekend here, so I'm hoping to catch up with myself a little, enjoy the sun from the shade, start a new book. I'm excited about this one.